Quite contrary to the flourishing trade of ivory diptych dials in Nuremberg there is hardly any evidence for these instruments having been produced in the Flemish region. The instrument described here is one of only six of Flemish origin recorded so far, all six being very similar in design. The attribution is based on the list of latitudes on the outer surface of the lower leaf. 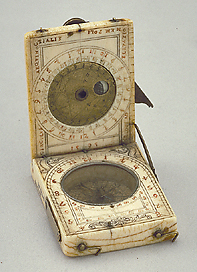 The instrument contains a nocturnal, an equinoctial dial, a lunar volvelle, an astrological diagram, a horizontal string gnomon dial and a latitude list.